"Recreation in Myrtle Beach is a serious business. Probably known best for golf, the Grand Strand features almost 200 courses..."
The Crown Jewel of the Grand Strand, which stretches from Georgetown, South Carolina, to Calabash, North Carolina, Myrtle Beach sits in the center of a 60-mile crescent of beautiful beaches. For years, the area's tranquil qualities have drawn tourists from around the world and have made Myrtle Beach one of the top retirement destinations in the country. 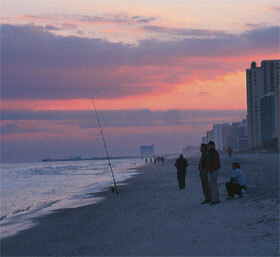 Myrtle Beach got its name from the indigenous wax myrtle shrub that thrives in the area's sandy soil. The first documented landing in the area was in 1526 by the Spanish sailing out of Hispaniola. However, the conquistadors did not find the area to their liking and left shortly thereafter, preferring the more southern latitudes of Florida for their base of operations. By the late 1800s, the strand of natural beaches had become a favorite of inland residents of both the Carolinas, though, at the time, accommodations were rustic and other than fishermen and nearby rice planters, few people established permanent homes at Myrtle Beach. All that changed, gradually at first, when a railroad was built between Myrtle Beach and Conway in 1908. Real development got underway in the 1960s in the newly-formed communities of North Myrtle Beach and Briarcliff Acres and has continued since. Today, Myrtle Beach is the 13th fastest growing metropolitan area in the United States, with just over 20,000 full-time residents, many of them retirees who enjoy the mild climate, beautiful beaches and friendly people. Recreation in Myrtle Beach is a serious business. Probably known best for golf, the Grand Strand features almost 200 courses, including some by the top designers in the country. 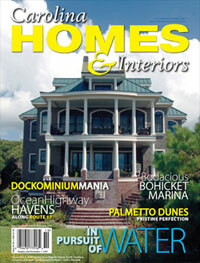 Sportsmen have both saltwater and freshwater fishing opportunities, along with some of the best hunting in the region. There are also historical museums with large Colonial and Civil War collections, and Myrtle Beach is home to spectacular amusement parks and a world-renowned boardwalk. Myrtle Beach is rapidly becoming the entertainment center of the East Coast and is often referred to as "the Branson of the South." With the recent addition of several live music venues, residents and visitors alike are treated to regular performances by some of the top artists in the country.